Chelsea made a complaint to UEFA about racist abuse being aimed at one of its players by Dynamo Kiev fans during a Europa League match, the English club said Monday. The abuse — reportedly targeted at Chelsea winger Callum Hudson-Odoi, who is black — took place near the end of its 5-0 win in the round of 16 on Thursday and was reported to the referee at the final whistle. Chelsea chairman Bruce Buck and club secretary David Barnard then spoke to UEFA's match delegate. "We wholeheartedly condemn such abhorrent behavior," Chelsea said in a statement. "We expect UEFA to conduct a fulsome investigation." Chelsea didn't specify which player was the target of the racist abuse. 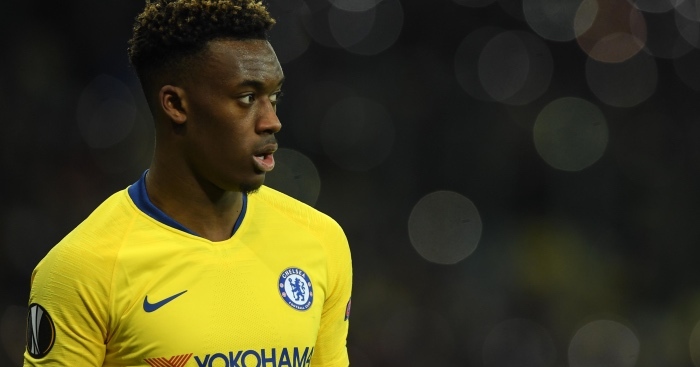 The club made the statement hours before England called up Hudson-Odoi for upcoming European Championship qualifiers. "It's a dream come true," said the winger, who replaced the injured Luke Shaw and did not comment on the apparent racist abuse in Ukraine. "Now I've got to work hard, enjoy every moment and keep working to just hopefully make an impact when I get the opportunity." Britain's Press Association reported that monkey chants were heard from a small group of Dynamo Kiev fans in the corner of the end Chelsea was attacking. That part of the stadium is home to the Rodychi fan group, which displays far-right symbols and was accused of involvement in several violent attacks last time Dynamo hosted Chelsea. In 2015, Dynamo fans attacked at least eight Chelsea supporters during a Champions League game. Most of the victims were black, and some were white who tried to protect the black fans. UEFA's anti-discrimination monitoring partner, Fare, which sends observers to major European games, captured video of four black men being chased through the crowd. The incidents all occurred in and around the Rodychi sector, though the group denied wrongdoing. Dynamo was ordered to play two matches behind closed doors and fined 100,000 euros (then $110,000). Both punishments were halved on appeal. Earlier that year, UEFA fined Dynamo and closed part of the stadium for racist fan behavior at a Europa League game against Everton. Last month, UEFA ended an investigation into anti-Semitic chants by Chelsea fans at a Europa League game against Vidi in Hungary. Chelsea had condemned the behavior of its supporters, apologizing and saying it is "abhorrent to this club," but did not face a sanction.